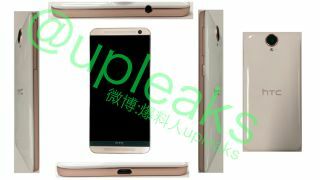 Update: Renowned Twitter leaker @Upleaks has supplied us with some more renders of a new HTC phone, and this time it's the HTC One E9 Plus. The images show off the handset in gun-metal grey, white and gold, with one version coming in a gold and white combo. We'd previously seen the E9 in some renders (story below), but it now seems there will be a larger version of the handset to come as well. However, as there's been no suggestion of specs so far, we don't know what the exact differences will be. If the HTC One M9 isn't quite cutting it for you, hang tight: there's another handset on the way from the Taiwanese firm in the shape of the One E9. A new image posted by @upleaks shows that this shape includes a glossy back for an extra eye-catching effect. It's likely to appeal to anyone who felt the all-metal HTC One M9 just wasn't plastic enough, though the existence of the phone hasn't been officially confirmed, and the word on the HTC street is that it may only go on sale in Chinese markets. Based on a few tip-offs we got wind of a couple of weeks ago, it sounds like the E9 might even be a better bet than the M9 in terms of screen size: it's said to be rocking a 5.5-inch QHD (1440 x 2560) display whereas the M9 settles for Full HD (1080 x 1920). As for specs, we're hearing rumours of a 2.2GHz octa-core MediaTek MT6795 CPU, 3GB of RAM, a 20MP camera and 32GB of storage. That puts it broadly in line with the HTC One M9 in terms of power. A variation on the device with a 13-megapixel snapper is also said to be on the way. Based on the information that's trickled out so far, this is going to be a bigger and slimmer version of the phone unveiled at MWC 2015, and it could come with dual SIM support. Exactly when we'll see it and where it will be available isn't yet clear. We're also waiting impatiently for the HTC One M9 Plus to break cover - that particular handset, if indeed it exists, is said to sport a larger screen, a physical home button and an integrated fingerprint sensor among some other goodies.